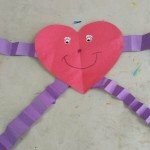 This accordion heart project is great for a day care, pre-school or elementary school kids. For the younger kids you can pre-cut all the shapes and have the older children cut them out themselves. You can even use this craft to have a most creative face contest. 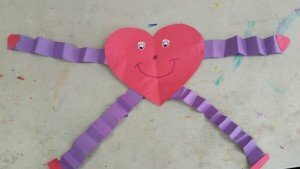 See what kind of heart faces the children come up with. Children always enjoy contests. Follow the step-by –step directions below to make your very own accordion heart craft. Step 1: Cut a large heart, two small hearts, 2 rectangles and four long strips out of construction paper. The paper can be all the same color or different colors. Step 2: Have the children fold the four long strips like a fan. Ex: fold down, flip over, fold down flip over and repeat this until the entire strip is folded. When you unfold the paper it will look like an accordion. Step 3: Have the children glue the accordion shapes to the large heart. These will be the arms and legs. Step 4: Have the children glue the smaller hearts to the ends of the arm strips. These will be the hands. Step 5: Have the children glue the rectangles to the bottom accordion strips. These will be the feet. Step 6: Use markers, crayons, glitter etc.. to decorate your accordion heart man/woman.